In this photo taken Jan. 26, 2016, Mayrem Humeyisu talks about food supply in her neighborhood in a rural village Dubti Woreda, Afar, Ethiopia. A new report finds more than a million people have been killed in more than 7,000 natural disasters stretching over a 20-year period. The report, “Poverty & Death: Disaster Mortality 1996-2015,” finds 90 percent of these disaster deaths occur in low-and-middle-income countries. An analysis of 20 years of data shows earthquakes and tsunamis are the biggest overall killers, followed closely by climate-related disasters, which have more than doubled over the period. The report, however, notes over the last 15 years, weather-related disasters including drought, heat waves, floods and storms have become the main cause of loss of life. The U.N. secretary-general’s special representative for disaster risk reduction, Robert Glasser, says there is a clear link between the deaths and climate change, as well as with income and development levels. “The irony is that those countries that have contributed least to climate change, to this crisis we face, are the ones that are being hit the hardest in terms of loss of life from these events, these increasingly frequent and severe weather and climate-related events,” said Glasser. Haiti is a prime example. Glasser notes that it suffered a devastating earthquake in 2010 and just last week was hit by Hurricane Matthew. The carribean island has lost more lives to natural hazards than any other country. 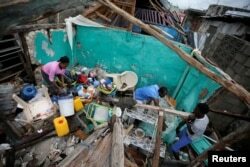 Haiti tops the list of the 10 countries with the most disaster deaths, followed by Indonesia and Myanmar. No rich country appears on this list; but, the report notes wealthy countries suffer the greatest economic losses from natural disasters, amounting to $400 billion or more a year. 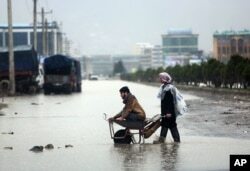 Afghans make their way in flooded water from heavy rain in Kabul, Afghanistan, April 2, 2016. Debarati Guha-Sapir, who heads the Center for Research on the Epidemiology of Disasters in Belgium, tells VOA that problems of migration are linked to civil conflicts and climate-related events in sub-Saharan Africa, Afghanistan and other countries. “These climate disasters, these repeated droughts or the repeated floods in sub-Saharan Africa, in Eritrea, in Ethiopia, in Sudan have a very important role, a very important part to play in the international migration flows,” said Guha-Sapir. The U.N. secretary-general, Ban Ki-moon, describes the report as a damning indictment of inequality. While rich countries suffer huge economic losses from natural disasters, people in poor countries, he says, pay with their lives.